It’s Not a Conference. It’s a Conversation. Cultivate is different than any youth ministry conference you’ve attended, because it’s not a conference — it’s a conversation. Rather than telling you what you should think, Cultivate exists to create thoughtful conversations that help youth workers minister in today’s world. Know someone interested in Graduate Residency? Have a friend or family member who might be interested in our graduate residency? Let us know and we can reach out to them. 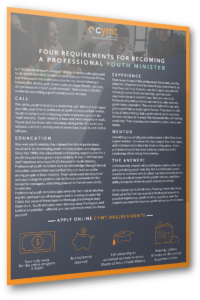 Do you know what it takes to be a professional youth minister? Want more insight on how to become a professional youth minister? Whether you’re a youth minister who wants training or a church in need of a stronger youth ministry, CYMT helps YOU create life-changing youth ministries through our Graduate Residency in Youth Ministry. Invest in youth ministry today! While the average burn out rate of a youth minister is less than 4 years, 90% of CYMT graduates are still in ministry. 55% of seminary students acquire debt. CYMT graduate residents do not rack up student debt. You only pay $1,500 for the 3-year program, and we cover the rest. 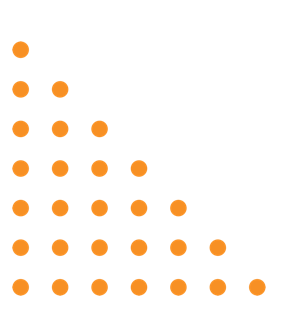 Only 17% of youth workers are trained. CYMT prepares you theologically and practically so you will stand out among the rest. Don’t worry; we’ll never share your email address and you can opt out at any time. love to send you more information!